VELA Samba 110 is a sit-stand chair with a shallow seat with raised lip at the front, so the user avoids the feeling of sliding down the seat when it is tilted forward. VELA Samba 120 is a sit-stand chair with an ergonomic, curved seat with V-shaped front edge, which assures the user of support and plenty of space for their thighs. 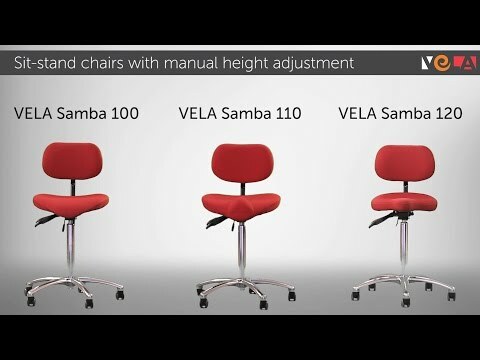 VELA Samba 130 has an ergonomic, curved seat with V-shaped front edge, which ensures the user's feet are placed apart and therefore affords an active, stable and upright sitting posture.